Just a overall shot of our back garden, it seems a bit empty in parts but we have put in quite a lot of bedding plants to fill up the gaps where things got killed of in the hard winter. I have put up my flag to support England at the World cup I just hope it's flying high next Saturday when we play the USA in our opening game. 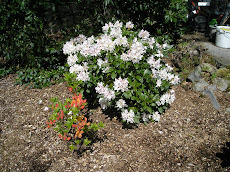 The rhododendrons are now just getting in to full flower which is the best part of a fortnight later than usual, they do make a good screen for my compost bins and store of old plant pots that are tucked in just behind them. Even Judy's hanging baskets starting to get in to flower. It's been a strange sort of week here in Cumbria with all the trouble on the west coast and it's put a bit of a damper on things even though we are about 30 miles away from where it all happened, it does make you think if it can happen here in Cumbria it can happen anywhere. On Wednesday there was that much police action going on it seemed more like Los Angeles than here, it's just so sad for everyone affected. Well on a more upbeat note I think I have finally worked out how to upload pictures with this new computer so I thought I'd give a quick look round and show how most things are looking today. The carrots are showing good growth recently and I think they are just a shade ahead of where they were this time last year, maybe it is because we have a lot more sunshine and warmth. After a steady start the potatoes have sprung into life and I will soon have to think about supporting the foliage and maybe start with a bit of blight control. The pumpkins are now starting to be hardened of ready to be planted out hopefully next weekend, I had to lift them inside this morning as they were getting a bit of a bashing in the heavy showers we have had this morning.